Hi friends! It's RELEASE DAY 😊 and we have a very special final day of hopping to share with you! We've combined our release hop with the kickoff to our April Diva Inspirations challenge. 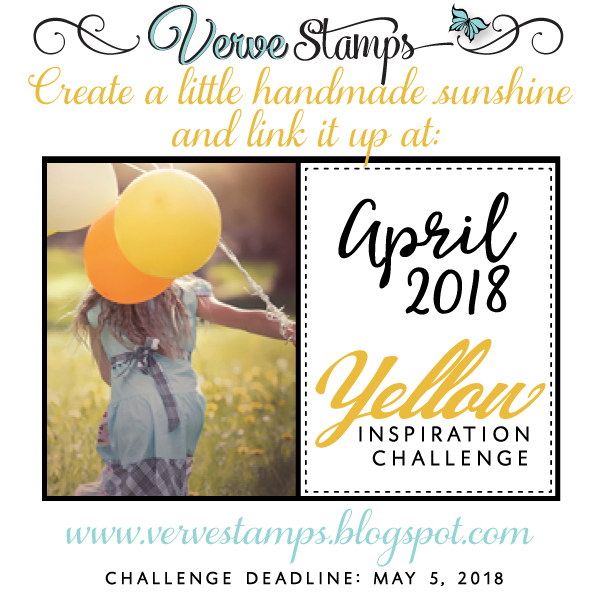 The theme this month is yellow, so get ready for a little handmade sunshine coming your way! And don't forget to leave a little comment love for the Divas as you hop about, because today's prize is for the entire April release! Woohoo! I'm the first stop on the Day 4 April New Release Spotlight Hop & Diva Inspirations challenge, so if you didn't arrive here from another hop spot you're in the perfect place to jump right in! All of the stamps and dies you've been seeing are available in the shop right now! Go ahead, check them out.... I'll wait! If you missed our earlier hops, you can click here for my Day One, Day Two and Day Three posts. Deadline for our blog hop prize drawing is April 15. Today's featured focus is designer's choice combined with our April inspiration, so you might just sneak a peek at a whole bunch of must-haves! Check out all the challenge details on the Verve blog today, then play along for a chance to win in our monthly challenge drawing! We hope you'll play along with us! Now, if you hadn't noticed from my cards lately, I love me some sunny yellow! Especially when it seems like spring just wants to elude us! 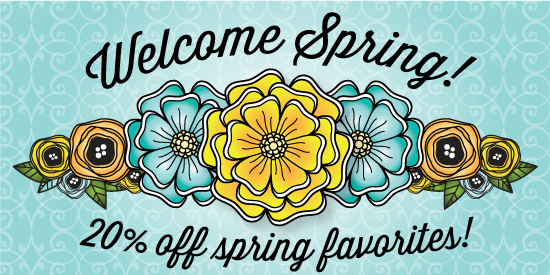 I'm all about creating my own sunshine, so I'm willing spring to come and stay with our Welcome Spring Sale this month! 😁 When you're done hopping, be sure to hit the Verve shop to check out the sale and the new products. All of our new releases are 15% off. Or double your savings by purchasing the Buy it All Bundle at a 30% discount. I have two cards to share today. The first card started with the cross from Risen Savior and the inspiration color of yellow. I knew I wanted it behind this sentiment, so cut an oval die to fit, then stamped the cross and the sentiment. I then put the die back over the die cut to sponge some squeezed lemonade around the edges and finished off with an air art tool with a brown marker for a few ink splatters. Next I moved on to the background. I added a thin layer of gesso to watercolor paper, then painted on some dylusions paint with a baby wipe. I added some squeezed lemonade distress oxide to the mix and then let things dry. The yellow had become a bit brighter than I wanted, so I scraped some heavy gesso in places, then used a script stencil to apply some light paste to the background. I love how it turned out. From there I went to work on the scalloped piece, attaching the larger scallop border die cut from the Lacey Trim Duo die set to a rose red rectangle panel and then covering with some pretty paper from the Eastertime collection by Authentique. I covered the seam with a few layers of baker's twine, tied in a bow, then accented with a paper flower. For my second card, I kept with the mixed media style, having fun with light paste, gesso, stencils and texture paste to create the tag. Next I stamped a flower from the previously released Bloom Brighter set twice, colored with Copics and cut with the coordinating Blooming die set. I added the leaves, also cut with the same die set and then stamped the thinking of you sentiment from Sentimental Wishes onto a Lacey Frames die cut circle. To finish the tag section, I added a flourish die cut, some glitter to the center of the flowers and a wrinkled seam binding bow a the top. For the rest of the card, I used a doily, a piece of smoky slate to tie in the other grays in the card and a card base embossed with the chicken wire embossing folder. My final touches were a couple rounded corners and the two border dies from the Lacey Trim Duo die set layered on top of the card for a fun, elegant edge. Want to win some shiny new Verve? Today's prize is a BIG one. We'll be picking a random commenter on one of the hop spots below to win our ENTIRE new release! 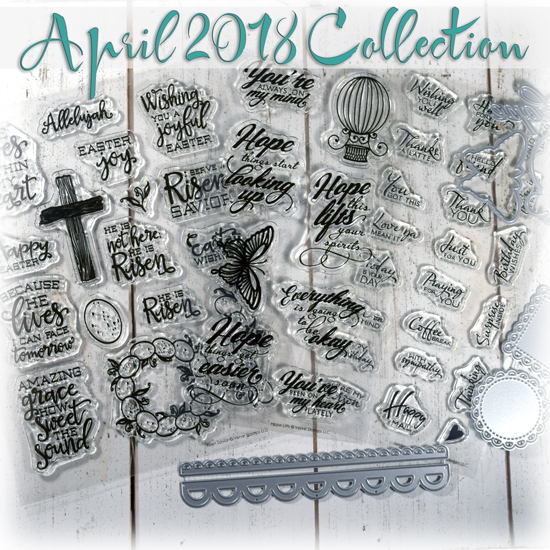 The April 2018 Release Collection includes Risen Savior, Hope Lifts, Sentimental Wishes, and the Lifted Hope, Lacey Frames and Lacey Trim Duo die sets. So be sure to leave a little comment on all the blogs below to increase your chances! Comment deadline for the blog hop prize drawing is April 15. Lovely cards. The colors are wonderful. Beautiful cards! Fabulous colours...love all the details! And the sentiments are awesome! Love your beautiful cards and the great color combos. Wow, a great prize. Who wouldn't want to win it. Thanks for being so generous. Beautiful layering and embellishments! Yellow is my favorite color but I find that I don't use it a lot for cardmaking. Love the textures on your second card and those stacked border die cuts! 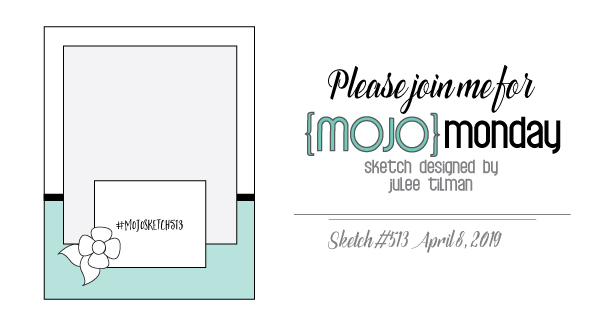 Love all the yummy dimension & layers in both cards, Julee. 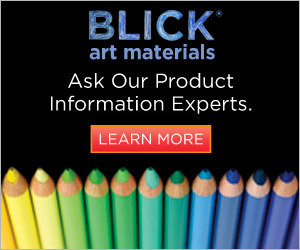 Fabulous release of beautiful products. Thank you for your generous spirit. Such beautiful MM backgrounds on both of these lovely cards Julee. Congrats on another great release. As usual, your cards are simply gorgeous! When I see yellow, it reminds me of my mom. She loved what I call the citrus colors-yellow, green and orange. Love your beautiful cards! Pretty colors and great layering! What a fabulous release and great giveaway! Great cards. Love the thinking of you card. Both cards are so beautiful, as are all of the stamps and sentiments. A lovely collection to celebrate the meaning of Easter. Julee, I love this new release!! Your first card is amazing!! 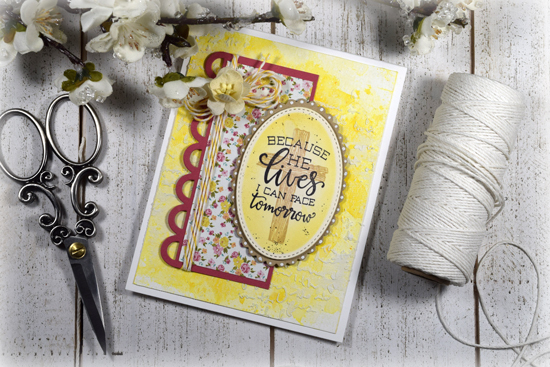 Love the yellow with the oval backdrop for the cross image and the fabulous "Because He Lives" sentiment (one of my favorite hymns). The second card is equally as gorgeous with the blues, doily and other wonderful details!! You are such an artist, sweet friend!! Your cards are so beautiful, and the sentiments are inspirational. Love the pretty yellow! Such lovely cards - love all the layers and embellishments. Beautiful cards! I like the texture, embellishments and uplifting sentiments. Beautiful cards but I especially love your first card. Love this new release! Both of your cards are absolutely stunning!!! You've made my wish list grow exponentially! This release is AMAZING!!! Pretty cards. I like the layers and colors. Love the sentiment on the first one. Gorgeous cards, Julee! I love the layering of the two lacy edge dies! Can't wait to order and to play along! So pretty Julee! Gorgeous fonts, texture, and lovely layers equal perfection. The new release is outstanding! Such beautiful cards, today. I love the entire release! 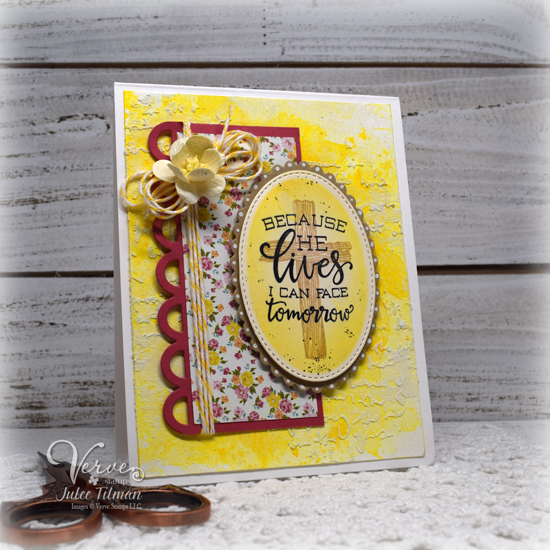 Such GREAT creations Julee; gosh I love that yellow card; the texture behind the yellow is so beautiful; I LOVE how vibrant the yellow is! 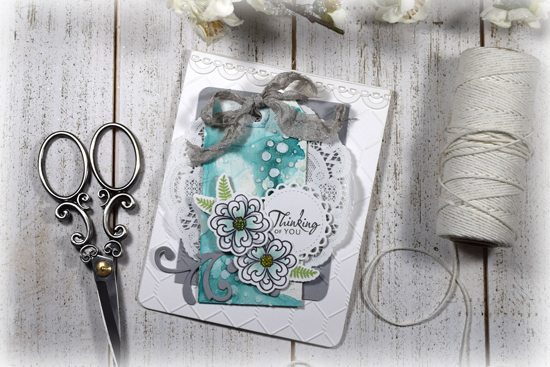 Love the 2nd card too; the embossing folder, those lacey border dies - I just love those dies! You create such beautiful stamps; thanks for having me this month!! Both cards are wonderful, Julee! Love the blend of pattern and textures! Beautiful cards. Yellow is such a great colour for this season, and a wonderful choice for your challenge. Such a pretty post with pretty cards! Fantastic cards Julee. Love the weathered cross from the risen savior stamp set. Fantastic background... great textures! As always your cards are really amazing! Details, colors and layouts are perfect! Thanks for sharing!!! Wonderful cards! Love your layers and design. The new challenge looks like fun. And love this new release. 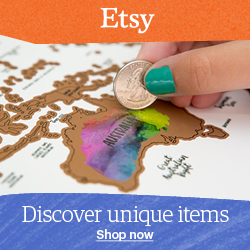 Your layouts and colors are amazing. I love these new stamps. All of this beauty piled up on that great embossed bg is just fabulous. this release is so beautiful!! your cards are gorgeous! I love the Risen Savior set. Great sentiments and your cards are beautiful! Love the backgrounds. Gorgeous cards! I love the yellow one!